The Democratic Peoples’ Republic of Korea 2008 Census was carried out 1-15 October. The observation by UNFPA international personnel to the Democratic Peoples’ Republic of Korea (DPRK) population census in 2008 was made in accordance with the Memorandum of Understanding, such as access to site, households, institutional living quarters, and questionnaires for military and prisons, despite of few challenges and spaces for improvement. All the 5 observation teams observed that the procedures of the census taking followed by the DPRK conform to the general international procedures. No major problems were observed and the errors have been or will be corrected through the supervision mechanism, and at the manual editing and coding stages. 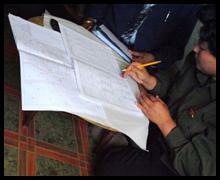 The data collected by the enumerators observed is accurate enough to ensure a good census. The teams also observed the commitment from the local authorities and census workers, and the good cooperation and hospitality from the respondents.